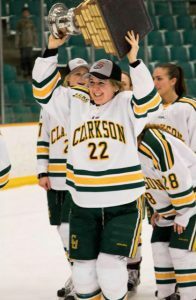 Cassidy Vinkle of Belleville plays forward for the Clarkson University Golden Knights, which last weekend won the U.S. National Collegiate Athletic Association championship. Photo by Clarkson University. BELLEVILLE – When the women’s hockey team at Clarkson University in Potsdam, N.Y., won a U.S. championship last weekend, Belleville native Cassidy Vinkle was one of the victorious players rushing the ice in celebration. The Clarkson Golden Knights defeated the Wisconsin Badgers Sunday to capture the National Collegiate Athletic Association championship. The game was the culmination of a four-team final tournament at the Family Arena in St. Charles, Mo. The Golden Knights took down the Badgers 3-0, capturing an empty netter in the final minute and a half of the game. Vinkle, 19, a forward with the team, is a graduate of St. Theresa Secondary School in Belleville. “There are no words to describe that feeling,” Vinkle told QNet News Wednesday night, describing the thrill of hoisting the NCAA trophy. One of the most memorable moments from that final game, she said, was skating by the opposing bench and hearing one of the players yell, “Come on, guys, stay positive!” It was at that moment that she knew her team’s energy and play were too much for the other team to handle, she said. Vinkle is in her sophomore year, studying business at Clarkson. Playing hockey was never a question for her, she said. She grew up in a hockey-oriented family in Belleville; both of her parents and an older sister played the game, and she’s been playing since she was four years old. She began playing competitively, for a team in the Belleville Bearcats association, when she was six. After nine years in the Bearcats, she went on to play in the Provincial Women’s Hockey League for the Whitby Jr. Wolves and eventually was recruited by Clarkson. Asked who her biggest influence was in terms of her hockey career, Vinkle said it was definitely her parents. Her dad, Brad, spent hours in the garage with her, working on shooting and stickhandling, while her mom, Tanya, was her coach on the Bearcats for six years. “They really motivated me to be the best player I could be, as well as the best teammate,” she said in an email interview from a vacation in the Dominican Republic. The win was a dream come true, and a lot of hard work by the team contributed to the moment, she said.